Drawing showing the area around Snodland in Kent. 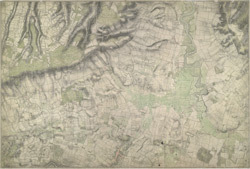 This map is drawn on rectangular sheet lines, enclosed by a black border. Fields are coloured brown where cultivated, and green if untilled. Stonework buildings or structures are drawn in red ink. Those made from less permanent materials, such as wood, appear in black or sepia. Corrections have been made on this plan and it is likely that the altitudes ('spot heights') of individual sites of eminence, noted in red-ink figures, are measured rather than merely estimated or sketched.